Multiple requests for the re-posting of this article (from 2015) have been made in the last several days. It's included here in its entirety (with updated cross-reference links at the end of the article). Besides belittling John McCain and prisoners of war everywhere, in July 2016 at the Family Leadership Summit, Donald Trump gave us a few other surprises. 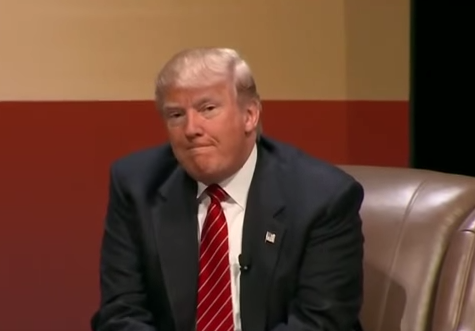 When Frank Luntz asked Trump (beginning at 7:28), "Have you ever asked God for forgiveness? ", the 2016 Republican presidential candidate initially couldn't answer the question. His circuitous and evasive response detailed how he attended church, loves God, loves his church as well as praise for his (former) pastor, Norman Vincent Peale (who passed twenty-four years ago). Yet Mr. Luntz had to ask him the question again, "But have you ever asked God for forgiveness?" 8:34.3 - During 8:34- 8:35, simultaneous with Luntz's words, "..... God for forgiveness?" - we see a fantastic example of what is known as a "Tongue Jut" - and more specifically a "Tight Tongue Jut" (not to be confused with a Loose Tongue Jut - which has a completely different meaning). This subconsciously initiated nonverbal signal projects the feeling of Disdain, Disgust, and Repulsion. 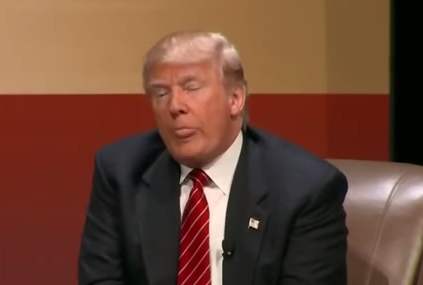 8:35.2 - Notice how drawn up and tight Trump's mouth opening is as his tongue jut begins. 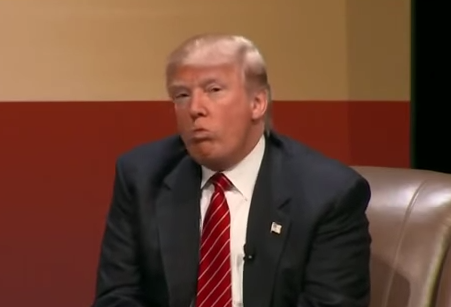 To anyone who has ever fed an infant who doesn't care for his food - the configuration of Donald's mouth and lips are highly reminiscent. 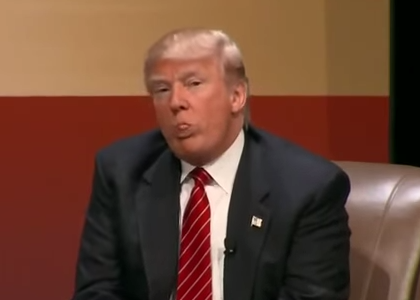 Trump's tongue too - much like any baby not wanting his pureed peas seems to be trying to physically push out the unwanted question. 8:35.5 - This series of facial nonverbal signals (in the first three images) can even be associated with levels of physical nausea (In fact, if you try to replicate this facial expression right now - you may even bring on micro-nausea in yourself). 8:36 - An instant later, we see another emotional display - with a jaw jut, nasal flaring, mid-face tightening, dramatic thinning of the lips, partial closure of the eyelids, lower lid tension and a strong lateral vectoring of the corners of his mouth - all indicate a significant level of anger. Summary: Certainly everyone in the United States (including then Candidate Trump of course) has the legal right to practice or not practice any religion or spirituality. Yet Trump's response is quite interesting - and very telling - for his nonverbal behavior indeed shows great hesitancy - and disdain, disgust, and repulsion for the question - over and above his more obvious verbal balking. Mr. Trump very much does not want to answer the question and moreover, he's angry that it was asked.